Solar Reserve, the Californian based energy company have announced plans to build the biggest solar plant the world have ever seen, in the state neighbouring Nevada. CEO Kevin Smith announced that the project has been budgeted $5billion to complete and will provide enough energy to power 1 million homes. Between 1’500 and 2’000 Megawatts of power will be generated, that amount of power is as much as a nuclear power plant, or the 2,000-megawatt Hoover Dam and far bigger than any other existing solar facility on Earth. One of the biggest common problem with solar energy has been its inability to perform on a 24hr basis; don’t worry though, Solar Reserve have that all figured out. 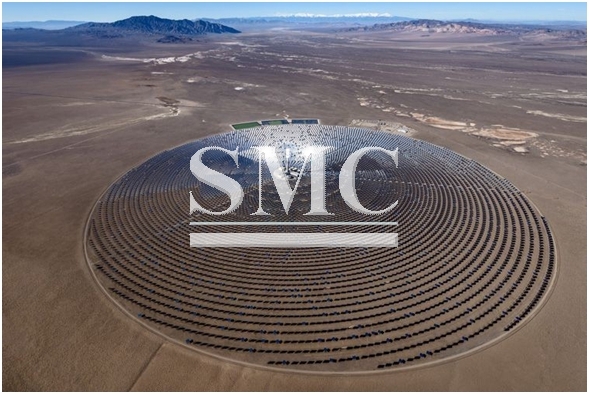 Solar Reserve’s Sandstone project involves at least 100,000 mirrored heliostats that capture the sun's rays and concentrates it onto 10 towers equipped with a molten salt energy storage system. The molten salt, heated to more than 1,000 degrees, then boils water and creates a steam turbine that can drive generators 24/7. Smith has said that the project will not begin for at least 2 years and possibly 3, however, on a positive note he said that the project will generate 3’000 jobs for as much as 7-years. Not only do solar plants provide the world with desperately needed clean energy, the larger plants are also usually constructed in remote and uninhabited zones – such as deserts.